Any copyrighted material on these pages is used in "fair use" for the purpose of study, review or critical analysis only, and will be removed at the request of copyright owner(s). Lyrics and tune VERY CLOSE to Dylan's "Don't Think Twice, It's All Right." Listed as No. 4 in "The Ten Worst Dylanesque Songwriting Ripoffs," in Jimmy Guterman & Owen O'Donnell, The Worst Rock n' Roll Records of All Time, New York, 1991, p. 97. Possibly based on the same source (Paul Clayton's " Who's Goin' To Buy You Ribbons When I'm Gone"). 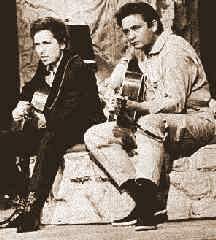 A Dylan/Cash duet version (medley with "Don't Think Twice, It's All Right") was recorded during the Feb 17, 1969 Nashville session (uncirculated). I'll be gone like I said. Lay there in your bed, keep your mouth shut till I'm gone. While I'm untanglin' my mind. While I'm breathin' air that ain't been breathed before. Then you'll understand your man.